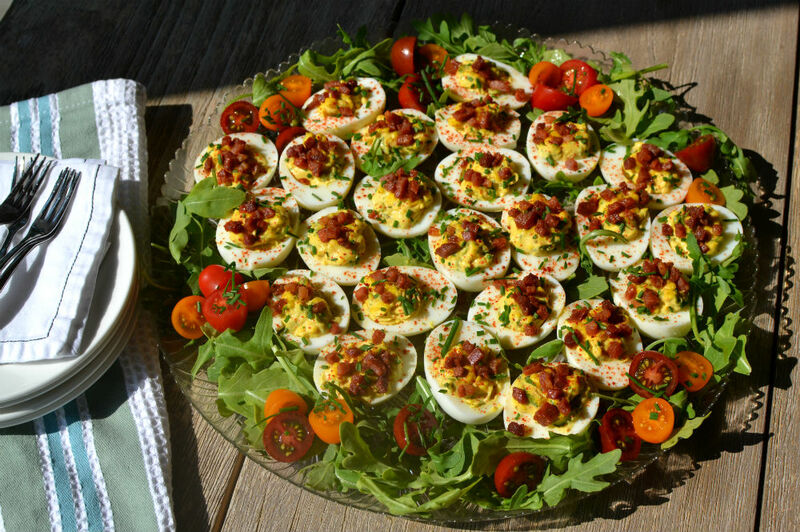 As I was putting together these BLT Deviled Eggs for a party last weekend, my daughter noted “very 50’s housewife, mom.” What? Since when? A few years back I made these Kimchi Deviled Eggs for a dinner party – even the kimchi skeptics gobbled them up. I think more often than not, the tried and true recipes do the trick (even those from the 50’s). Dinner Party = Beef Bourguignon, BBQ = Country Style Ribs and Corn Salad, Brunch = Eggs Benedict, Deviled Eggs = Fabulous Party! Judging by how fast they disappeared — I think they were a hit. Place uncooked eggs in a pot with room temperature water, bring the water to a boil, turn the stove off, cover the pot, and let the eggs sit for 12-13 minutes in super-hot-but-not-actually-boiling water. This will result in perfectly boiled eggs with firm egg whites and golden yolks. Drain, add cool water to pot and let sit a few minutes until they are cool enough to handle. In a skillet cook up the bacon or prosciutto until browned and nicely crisp, set aside. Peel the eggs, cut in half remove and pass the yolks through a fine mesh stainer into a medium size bowl. Add the mayo, mustard, parsley, lemon zest, salt and pepper and mix well. Line your serving platter with arugula and the cherry tomatoes, drizzle over a bit of olive oil and add a pinch of salt. Place the egg halves on the platter and spoon or pipe in the yolk mixture, place some bacon on top and shower with parsley and chives. Sprinkle all over with gochugaru or paprika.